Selection Procedure: Eligible candidates will be called for personal interview generally in the ratio of 1:5 depending on suitable no. of candidates and decision of Stree Nidhi in this regard shall be final. a. While applying for the post, the applicant should ensure that he/she fulfills the prescribed eligibility norms and particulars furnished are correct in all respects. In case, if it is detected at any stage that a candidate does not fulfill the eligibility conditions or that he/she has furnished any incorrect/false information or has suppressed any material fact(s), his/her appointment will automatically stands cancelled and necessary further action will be initiated. Candidates with criminal background/ disciplinary proceedings involved in Frauds etc., are not eligible to apply. b. The candidate must be a native of Telangana state only. c. Mere submission of application against the advertisement and apparently fulfilling the criteria as prescribed in the advertisement would not bestow on them any right to be called for written exam. d. In case of suitable and deserving cases, any of the requirements, including age and conditions of eligibility mentioned above, may be relaxed at the discretion of the Managing Director of Stree Nidhi. 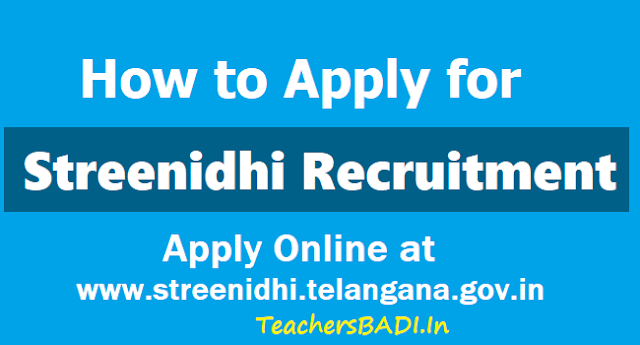 e. Applications must be submitted in the prescribed word document format which can be down loaded from Stree Nidhi website mentioned above and application in any other format will be rejected. Candidates must fill in details in the format either by typing or by filling the details with Black/Blue ball point pen, clearly and legibly. f. Those Candidates who have already attended the interview earlier on two occasions and not selected, and those who do not have knowledge in Telugu need not apply again. g. The Managing Director, Stree Nidhi reserves the right to keep in abeyance or cancel the recruitment at any point of time without assigning any reason what so ever. h. Legal disputes, if any, will be entertained within the jurisdiction of Hyderabad only. Submission of Application - Eligible candidates have to download the Application Form given in Annexure-II from the Official website. Last date of receipt of application is 31st December, 2018. The application form should be as per the proforma enclosed. No application shall be entertained after the stipulated date. Incomplete application forms will be rejected. Address the application, super scribing the Post Name and Code and Application for which he/she is applying for (Specify post name and code as “Application for the post of Deputy General Manager/Zonal Manager/Regional Managers/Chief Manager/ Assistant Manager/Consultant (IT)/Office Assistant (Attender) Code No: ________ “) the post to be sent to the following address by post or in person. 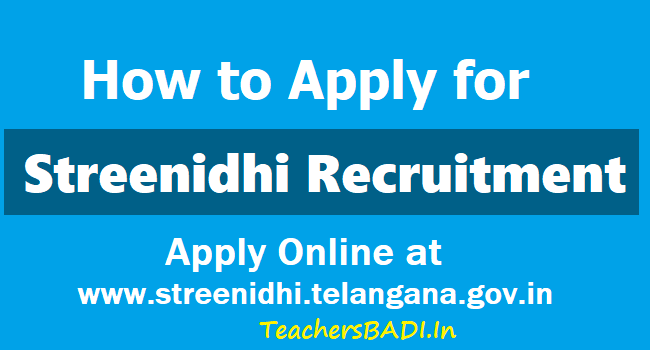 How to apply for Streenindhi Recruitment 2018? Stree Nidhi Credit Cooperative Federation Ltd is an apex society at State Level registered under State Cooperative Societies Act’1964 with its registered office located in Hyderabad. Stree Nidhi is promoted jointly by the Govt. of Telangana and federations of SHGs and commenced operations from 06.10.2011.